For other uses, see Moccasin (disambiguation). A moccasin is a shoe, made of deerskin or other soft leather, consisting of a sole (made with leather that has not been "worked") and sides made of one piece of leather, stitched together at the top, and sometimes with a vamp (additional panel of leather). The sole is soft and flexible and the upper part often is adorned with embroidery or beading. Though sometimes worn inside, it is chiefly intended for outdoor use. Historically, it is the footwear of many indigenous people of North America; moreover, hunters, traders, and European settlers wore them. 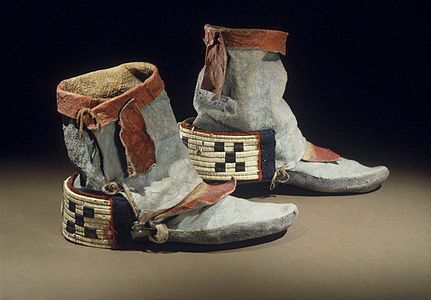 Etymologically, the moccasin derives from the Algonquian language Powhatan word makasin (cognate to Massachusett mohkisson / mokussin, Ojibwa makizin, Mi'kmaq mksɨn), and from the Proto-Algonquian word *maxkeseni (shoe). Shearers' moccasins on a wool rolling table. 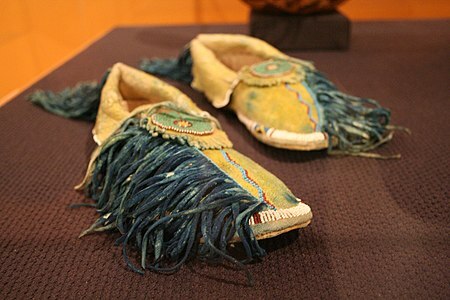 In the 1800s, moccasins usually were part of a Canadian regalia, e.g. a powwow suit of clothes. The most common style is that of the Plains Indians moccasin. In New Zealand and Australia, sheep shearers' moccasins are constructed of a synthetic, cream-colored felt, with a back seam and gathered at the top of the rounded toe. These moccasins are laced in the front, and the lacing is covered with a flap fastened with a buckle at the shoe's outer side. The fastener arrangement prevents the shearer's handpiece comb from catching in the laces. Shearers' moccasins protect the feet, grip wooden floors well, and absorb sweat. The word moccasin can also denote a shoe of deer leather adorned with laces. Rubber-dotted - These have a uniform covering of small, round rubber pads. Separated Pad - These have larger, flat rubber pads separated by only small areas. Moc Toe Boots, commonly referred as a "Moc Toe", the boots are normally combined with hard rubber compounded soles. The moccasin toe work boot is a style that reflects the Native American moccasin. Normally by weld stitching two pieces of leather or fabric, the pattern creates a U-shaped design around the toe box. ^ a b c d Chisholm, Hugh, ed. (1911). "Moccasin" . Encyclopædia Britannica. 18 (11th ed.). Cambridge University Press. p. 637. ^ "Moccasin - Define Moccasin at Dictionary.com". Dictionary.com. Retrieved 7 October 2014. ^ "97/311/1 Shearing moccasins (pair), mens, synthetic felt, Australia, 1997 - Powerhouse Museum Collection". Retrieved 7 October 2014. ^ Gustashaw, Megan (2016-06-05). "The Rules of Wearing Driving Shoes". GQ. Retrieved 2018-02-21. 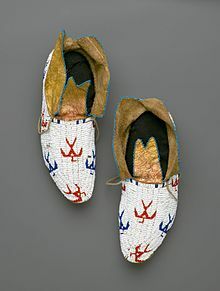 Wikimedia Commons has media related to Moccasins. Look up moccasin in Wiktionary, the free dictionary. This page was last edited on 23 April 2019, at 01:57 (UTC).